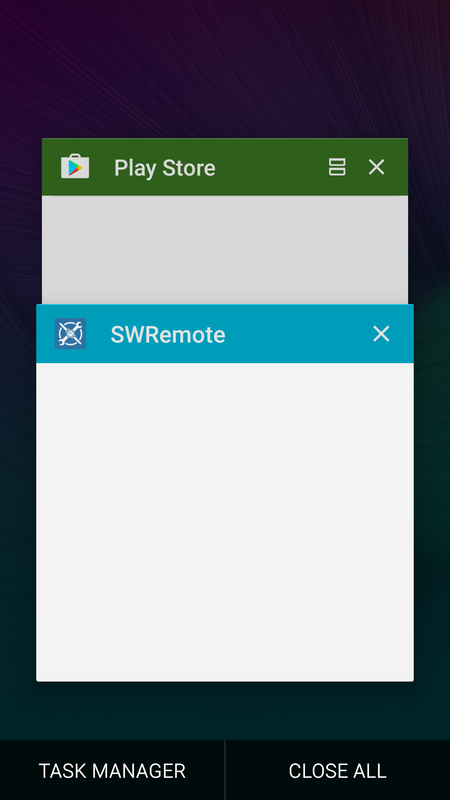 How do I terminate the SWRemote application on an Android device running Android 5 or higher? All Open Apps should display. Swipe SWRemote to the right or left, and it will disappear from the list. Tap the "home" button again, and then tap on SWRemote to relaunch it. The world of Android devices is very diverse. Some manufacturers and carriers will make changes from the standard, so your device may have a different setup for closing SWRemote through the Task Manager. You may wish to speak to your office for help if these instructions do not work on your device.